Yangtze River, together with the Yellow River, is the cradle of Chinese civilization. Flowing from the holy Qinghai-Tibet Plateau to the dynamic Shanghai city, the Yangtze River is the mother river for the large area of southern China. Taking a cruise through the most essential part of Yangtze from Chongqing to Yichang, is absolutely the best way of exploring the nature, history and culture of China first-hand! Without traffic jams and any hassle about accommodation, your Yangtze Three Gorges cruise can be a completely worry-free vacation. Sail across the natural wonder. Witness the WORLD largest Dam. Discover and experience the REAL local. Make every day a unique memory. The marvelous Three Gorges, the interesting shore excursions, the world largest Three Gorges Dam as well as various colorful on board experiences are recommended as the four highlights of a Yangtze cruise. Whether you prefer to sail across the natural wonder, Three Gorges, to witness the world-largest dam-Three Gorges Dam, to take interesting shore excursions and experience the authentic lives of local people; or to attend various onboard activities on Chinese culture or just relax on the sun deck, you will be surprised by how much you will experience! 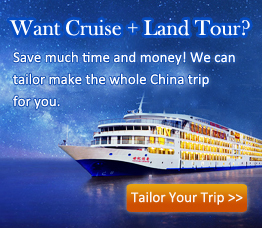 Come to experience the four highlights and enjoy a lifetime Yangtze cruise!